Every year March 30 is celebrated as Rajasthan Diwas or Rajasthan Day, which marks the formation of this state. The kingdoms of Jodhpur, Jaipur, Jaisalmer and Bikaner were accessed together to form the present day state of Rajasthan on March 30, 1949. The present-day Rajasthan was formed in 7 stages. Rajasthan carries a royal cultural history because of it being ruled by great kings in the past. Rajasthan is derived from Raja meaning king and Sthan which means abode, so it literally means the 'land of Kings.' The Rajasthan Foundation Day or Rajasthan Diwas is thus a very important day in the state and is celebrated by arranging various programmes and cultural events all across. It is an important day for the citizens of the state and many people are thus exchanging wishes for Rajasthan Diwas on social media. November 1 is State Formation Day for Seven Indian States: Know Why and How Karnataka, Kerala, MP, Punjab, Haryana, Rajasthan and Chhattisgarh Formed. Rajasthan is the largest state area wise in India. On March 30, 1949, Rajputana (as it was called by the British Raj) was merged into the Dominion of India. Jaipur, the largest city is the capital of this state. The state, however, officially came into existence on November 1, 1956. Rajasthan carries a deep cultural and historical significance. Some parts of the present-day state were part of the Vedic Civilisation and Indus Valley Civilisation. It was later ruled by dynasties like Gurjars, Rajputs, Jats, Meenas, Bhils, Yadavs, Bishnois among others, all of which made a great contribution in the building of this state. Several people, including politicians, parliamentary members have expressed congratulatory wishes for this day. People have appreciated the vibrant history and culture of this place and expressed their pride in being born in this state. Check greetings and wishes for Rajasthan Diwas on Twitter. 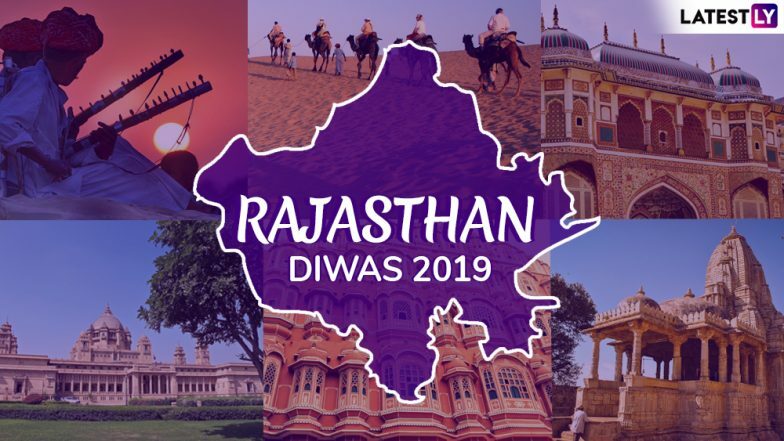 Rajasthan Diwas: CM Vasundhara Raje Extends Greetings to People of Her State. My heartiest greetings on the occasion of #RajasthanDiwas. It is a day to commemorate the valour, strong will power and sacrifice of the people of #Rajasthan. Rajathan a name that proposes a kaleidoscope of colourful images, amazing people, delectable cuisines, rich culture, royal places and much more.There is no way this land of warriors will cease to mesmerize you. Deserts vibrant streets with lively and welcoming people saying 'Padharo Mhare Des' Rajasthan a state that actually lives up to the saying Atithi Devo Bhava.The regal history with magnanimous palaces telling the tales of ourglorious past. There are several programmes and events that are organised on this day which celebrate the glorious past of this state. Rajasthan has a great display of royal architecture, vast desert spans and vibrant culture, which also makes it a popular tourist spot in the country.